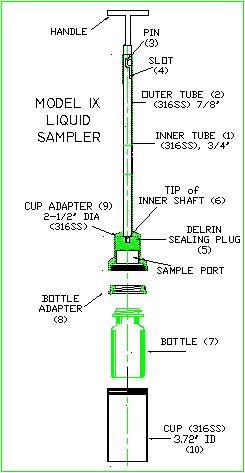 This sampler is available for use with 5cc and 60cc sterile disposable syringes. 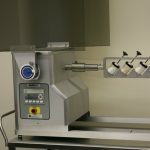 Model XI-B Liquid Sampler, 48” long, 1.0” OD, made of 316L stainless steel with RA 10 finish (mirror finish) on the inside, electropolished, and passivated as per ASTM A-967 standards. Model IX is a custom-made and it takes one sample into a glass or plastic bottle. The bottle is enclosed in a stainless steel cup and does not get wet outside.